Let’s begin in Rome today where the Pope addressed the pilgrims at his weekly General Audience. Reflecting on 1 Cor 15, the Pope said that the Risen Christ is the hope of Christians, since his resurrection is the event that grounds our faith. Here’s the summary from Rome. In France, you may recall Fr. Jacques Hamel who was brutally killed while celebrating Mass last July. The Archdiocese of Rouen has formally begin the process of his beatification to sainthood. Fr. Hamel was killed last summer as he celebrated Mass when two men who claimed allegiance to the Islamic State stormed the church, taking several hostages then slit Father Hamel's throat. Traditionally, the Vatican requires a five-year waiting period after the death of a candidate for sainthood before a cause is opened but the Pope waived the rule in response to pleas from French Catholics last fall. The inquiry is the 1st step toward possible sainthood, but it is expected to take several years. However, the beatification process of a martyr is a simpler process because there is no need to prove that a miracle occurred through his intercession. We’ll keep you up to date as the story unfolds. Now, just 10 days before the Pope is scheduled to visit Egypt and just over a week after two deadly church bombings, gunmen attacked security forces near St. Catherine's Monastery in Egypt's south Sinai yesterday, killing one police officer and injuring four others. Reuters has reported that the Islamic State has claimed responsibility for this new attack outside the entrance to the monastery which is one of the world's most important Christian sites in the country. This latest wave of violence against Christians has marked one of the bloodiest periods for the country's Christian minority in decades with this third church attack which has resulted in many dozens killed and injured in four months. On Easter Sunday, Emeritus Pope Benedict celebrated his 90th birthday. And since his birthday fell on Easter this year, a celebration for this great milestone was held yesterday in Bavarian style keeping with the retired pontiff’s roots. Attending the party was a delegation from Bavaria and Pope Benedict’s own brother, Monsignor Georg Ratzinger. In a recent interview with Vatican Radio, his aide, Archbishop Georg Gaenswein, said that although the retired pontiff is 90, his health is basically good and he continues to keep a very active schedule. Save the Date. This Friday the Henri Nouwen Society is having a launch for the new book entitled: Love, Henry - here in Toronto. 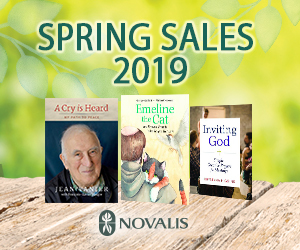 This new publication is a beautiful collection of over 200 unpublished letters written by Nouwen that sheds light and provides insight on the sacred longings of the human heart. Its compiled and edited by Henri Nouwen archivist, Gabrielle Earnshaw.